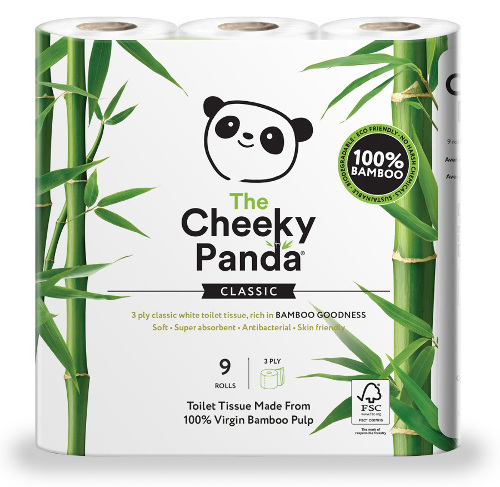 You might have noticed we’ve recently expanded our range of toilet paper to include sustainable bamboo toilet roll from The Cheeky Panda. We all use toilet roll, and we probably use a lot in our lifetime, so why not choose a sustainable alternative? We’ve been stocking recycled paper toilet tissue for a long time now, and that’s already a great alternative. So why bamboo? Well it’s so much more sustainable than regular branded toilet paper which more often than not is made with an FSC material mix, rather than being 100% from FSC materials like The Cheeky Panda is. Bamboo grows 30 times faster than other trees. It also produces 30% more oxygen and absorbs 35% more carbon from the air. It’s hard to disagree with those kinds of ethical credentials! And The Cheeky Panda toilet roll is made with surplus bamboo which would have gone to waste otherwise. The Cheeky Panda 3ply toilet paper is incredibly soft against your skin. Bamboo is naturally anti-bacterial, anti-fungal, odour resistant and hypoallergenic. It’s also free from nasty chemicals like harsh de-inking agents or B.P.A. Have you tried The Cheeky Panda or another brand of bamboo toilet paper? Let us know what you thought in the comments below!